The last eruption on Maui. A small portion of the ‘Ahihi Bay area is the only portion of this reserve that remains open to the public. 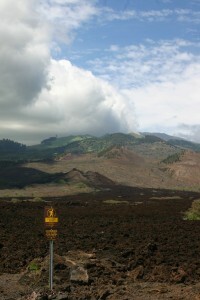 In times past this area was loaded with prime snorkeling and kayaking, plus some interesting lava field hikes. Don’t fret – while the reserve is closed, excellent snorkeling can still be found. Lava field hikes are also still open past the southern boundaries of the reserve into the La Perouse Bay area. Due to the closure, this is a drive-through experience as the road to La Perouse bisects the mauka and makai sections of the reserve. The lava here is the youngest on the island, and there is some debate as to when it last erupted. Carbon dating says ~1500-1600. But in the 1800’s, Europeans who misunderstood many of the nuances of the Hawaiian language, determined that this eruption was in 1790. The 1790 figure relies on a shaky translation of “the time of our grandparents” as literal, combined with some other data also of questionable source. People still like to quote the more recent date, I believe because it hits home the fact that Haleakala is still an active volcano which is all but certain to erupt again. When looking at the lava fields for the first time, you may mistake it for tilled earth. This is ‘a’ā lava, the most common form of lava, and distinguished by a chunky, sharp, rough clinkers (yeah, that’s a real word!) covering the surface of the flow. If you look uphill while passing through the flow, you can clearly see the vent that was the source of this eruption. Click this image to read the sign - the close date has been extended into 2016. Careless descriptions in guidebooks along with some less than environmentally sound kayak tour companies literally trampled this fragile reserve ecosystem down. Areas like Mokuha (aka “Fishbowl”) and Kalaeloa (aka “Aquarium”) became an unsustainable draw for people after being publicized and commercially exploited. Years ago commercial kayak tours were banned in the hopes that it would move the impact toward sustainability. But do-it-yourself hikers spurred on by Maui’s most popular mass-market guidebook kept the tourists coming in droves. Self-guided visitors are almost always far less informed as those being guided, and so by removing the more knowledgeable guides from the mix, the unintended consequence was even less educated visitors. 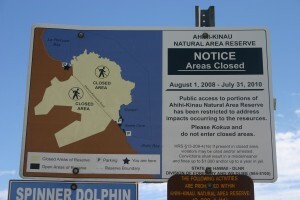 In 2008 the decision was made to close off almost the entire reserve to the public for two years while a better way to manage it was determined. When the deadline came in 2010 (and again in 2012, 2014 and 2016) they still had not drafted a functional plan, the closure was extended for an additional two years each time; it is now closed until at least 2018. On the mauka side, munitions debris were also found during this same period (did I mention this was a former military training area?) This fact, along with the military being on a similar glacial-inspired time schedule with (not) issuing findings have all contributed toward the decision to include the entire area in the closing. Ocean portions of the reserve are only closed to motorized craft, fishing, and taking of natural resources. Technically, you may enter at La Perouse Bay and snorkel or kayak makai the land boundary of reserve. This area is great for intermediate to advanced snorkelers, however, you absolutely must come informed and prepared and you don’t want to touch anything – including barren land (exposed lava rocks and islets included) or you could be looking at a hefty fine. If there is any question at all as to your ability and understanding, please let this area rest. What is the name of the white flower blooming on what appeared to be shrubs along the path to the snorkelling site? Are they small and look like half of a flower? Maybe the naupaka? Perfect! Thank you for the quick response! Hi there! I am coming with my family for a visit (we are so excited to get a break from the Canadian winter!!) and will be staying near Kihei. Our last visit, years ago, we snorkelled at the the “aquarium” and I am sad to hear that it is closed, but grateful that it is being taken care of. Some areas I saw had been devastated by all the traffic and uniformed people. Snorkelling where we will not be harming the area??? Aloha, the closure has been extended until August 2016, and I do hope there will be significant protection of this area indefinitely. same question. I’m coming next week is it open now? Has this area been reopened? Mahalo for any update. Well done–just discovered our website, and as a longtime Maui resident and writer, I’m impressed with your thoughtful, accurate and sensitive content. Mahalo! I tried to contact you, but there’s no “contact form” on the page. Can you drop me a line please? Yes, it is legal to kayak and snorkel. It is not legal to land (or even touch any land) within the preserve boundaries, however. You said you were here in 2008, so the kayak rentals and tours were banned already, but for others reading, you will need to bring a kayak with you to this area – there are no commercial activities allowed. Above all, always know how to snorkel and kayak without damaging the reef before entering these areas. Have fun! Hello! We’re visiting Maui again this summer and were hoping to again kayak and snorkel, via La Perouse, around Ahihi-Kinau (as we did in 2008). I’m really confused by what is now allowed by the closure of the area and can’t find solid info online. Your map suggests that putting in at La Perouse and kayaking the waters in the preserve is still allowed; is that correct? And though we wouldn’t want to disturb areas like Fishbowl/Aquarium while they rest, I’ve gotta know–is it indeed legal to snorkel there from a kayak? Great Google map of the area, by the way! !